The word Bresaola, formerly Brazaola, Brisaola or Bresavola, has uncertain origins. Its etymology can be found in words brasa (embers) or brisa: brasa were braziers used to dry air in the rooms used for seasoning process while brisa it's a dialect word for "salting". The typical zone of production coincides with the territory of the County of Sondrio in Lombardy; its morphology is based upon two valleys situated in the heart of the Alps: Valtellina and Valchiavenna. The climate of the valley is the main secret that characterizes the production of Bresaola della Valtellina and makes it a typical product, unique and inimitable. The fresh air and clear air that descends from the heart of the Alps and the particular shape of the Province of Sondrio create ideal conditions for the gradual maturing of bresaola. But the climate is not the only factor. The charm of this high-quality sausage, made with the best cuts of beef thigh, is implicit in its transformation, since the processing steps must follow strict rules, that tradition has turned into a veritable ritual, repeated father to son with passion and professionalism. The ability to choose the best cuts of adult cattle, the tip of the hip and topside, the ability of trimming, the skillful balance of natural flavorings used, rooted in the ancient secret recipes. Massage of salting meat, the right temperature and humidity, which must be in precise time and manner during the aging process, are still the legacy of a written culture in local tradition. 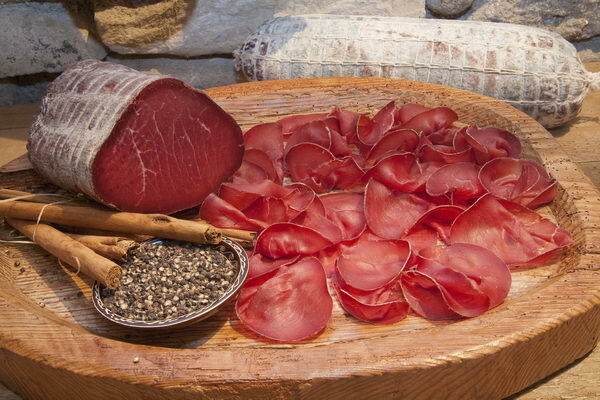 Today the real Bresaola della Valtellina - which differs from the "dried meat" and other products derived from the dried beef - is guaranteed by the Community trade mark IGP (Protected Geographical Indication), used by producers in the province of Sondrio. The brand is recognized only to the master butchers who adhere to strict production, under the strict supervision of the Control CSQA Certification Ltd and the Consortium, authorized by the Ministry of Agriculture and Forestry. Bresaola della Valtellina should bring the following information on the label: "Bresaola della Valtellina", which is untranslatable, and the label must be affixed in clear, indelible, clearly distinguishable from each other and be written in block letters immediately followed the same size, the initials and the IGP symbol EU, which must be produced in the language in which the product is marketed, in the form permitted by the EC. It is prohibited to add any description that is not expressly provided for. Bresaola della Valtellina can be sold whole, in bulk or in a vacuum, in pieces, in pieces or sliced vacuum packaged or modified atmosphere. Bresaola della Valtellina has no more boundaries. The opinion of the Animal Plant Health Inspection Service (APHIS) of the Ministry of Agriculture of the United States has opened the doors to the famous Valtellina product. Following the opening of the market to meats at early ages, the U.S. authorities have confirmed the possibility for companies to export Italian Bresaola della Valtellina obtained from American meat from the circuit guaranteed for absence of use of growth hormones. «It’s a great result, achieved thanks to a joint effort at institutional level – said Mario della Porta, president of the Consortium of Bresaola della Valtellina IGP. We will support our member companies in this path that reveals growth margins very interesting for Bresaola», concludes Della Porta. Bresaola della Valtellina is a very nutritious sausage, by far the most low-fat, high in protein, iron, vitamins and minerals and highly digestible. It meets requirements of all consumers interested in a correct diet: it's rich in proteins, poor in fat and calories, it gives a good supply of iron, zinc, vitamin b1, b6, b12. It contains no carbohydrate, calcium and vitamin D, which can be added having bread, Parmesan cheese and lemon slices together with bresaola. 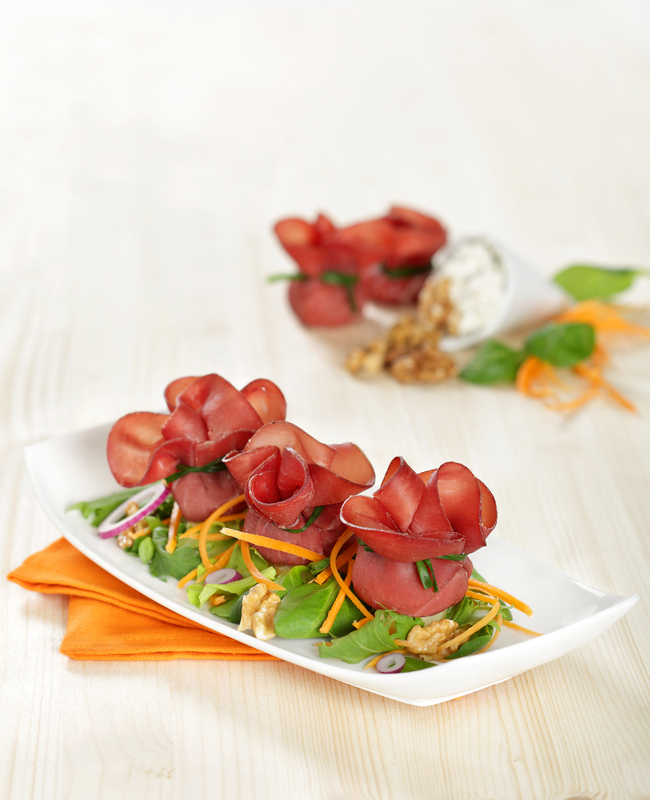 Bresaola is a versatile ingredient that allows the invention and imaginative combinations of refined dishes and appetizers and snacks that are quick and easy to prepare. The slice must be served with a thin (1.0 to 1.5 mm). Only in this way we will be able to appreciate the softness and fragrance of the Bresaola of the Valtellina.